Kader Khan‘s son, Sarfaraz has shared his views on the film industry’s reaction to his father’s death. He has also reacted on actor Govinda’s tweet in which the actor called Khan a ‘father figure’. Sarfaraz talked to IANS recently and revealed that no one from the film industry cared to call him when he fell ill. He called out the hypocrisy of Bollywood stars and said that not many have called the grieving family to give condolences. 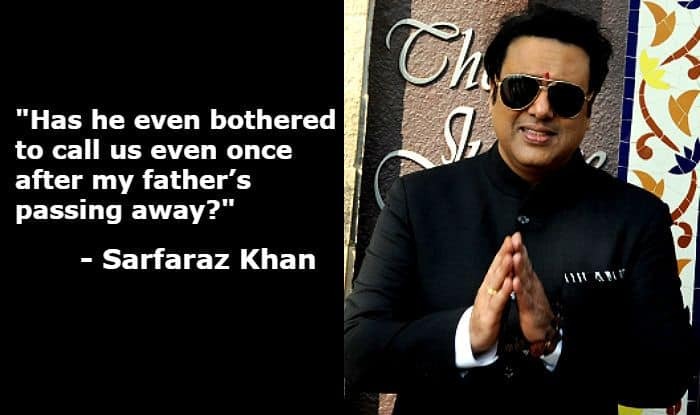 When informed about Govinda’s tweet, Sarfaraz said the actor never took any pain in inquiring about his father’s health. He said, “Please ask Govinda how many times he inquired about his father figure’s health. Has he even bothered to call us even once after my father’s passing away? This is the way our film industry has become”. Sarfaraz also mentioned that the industry works on ‘out-of-sight-out-of-mind’ notion and once someone gets old and stays away from the business, no one takes efforts of remembering the person. He revealed that he and others from the family will not let anyone forget Kader Khan. He said, “My father has contributed so much to Hindi cinema. We intend to honour his memory in a substantial and relevant way. At the moment we’re all mourning his going. But I can assure his fans all over the world that we won’t let the film industry forget him”. Assuring the actor’s fans that his father passed away in peace, Sarafaraz also revealed that there was a smile on Kader Khan’s face when he took his last breath. He said, “There was a smile on my father’s face when he passed away. I cherish that smile more than anything else in the world. My father’s final years were very painful for him. He suffered from a degenerative disease that left him completely without the will to do anything. He got the best possible medical care here in Toronto”. May his soul rest in peace!